Philippine Airlines (PAL) is in talks with an undisclosed strategic foreign investor and wants to close the deal by the end of this year, according to a report by Bloomberg News. 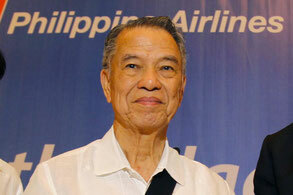 However, billionaire Lucio Tan and chairman of the LT Group Inc. conglomerate, which owns his airline, banking, liquor, brewery, property and tobacco businesses, said in a recent interview with Bloomberg that he first plans to return PAL to profit before selling a stake. "I will not sell unless it earns money," stated Tan (83). "Airlines are a very competitive business." PAL Holdings Inc., the carrier's parent, booked a net loss of 501 million pesos (US$9.8 million) in the second quarter after reporting a 1.13 billion peso deficit in the previous quarter as higher fuel costs and aircraft lease charges boosted expenses. Tan, the Philippine's second-richest person, is vowing to revive profit at the carrier amid an increase in tourist arrivals in the country. Philippine Airlines has been acquiring new planes and expanding destinations and flight frequencies as rising income among Filipinos boosts travel. The LT Group chairman had a net worth of US$5.9 billion as of Sept. 8, according to Bloomberg Billionaires Index. His wealth gained about 13 percent, or US$651 million this year, boosted by a 39 percent advance in LT Group shares. The Bloomberg report quoted Tan as saying that he is preparing to hand over the reins to the conglomerate and that he has a succession plan in place. He declined to be specific. Apart from competition on domestic and regional routes by low-cost carriers Cebu Pacific and Air Asia, PAL has been facing rising rivalry on its lucrative trans-Pacific routes to the U.S., notably from North Asian carriers Korean Air, Cathay Pacific and EVA Air. PAL currently has three nonstop routes in continental U.S., including Manila-Los Angeles, Manila-San Francisco, and a one one-stop route, Manila-New York via Vancouver. It also operates flights to Guam and Hawaii. The route Cebu – Los Angeles was temporarily suspended last May with no date for the continuation of this service given by the airline. The flag carrier is looking to upgrade its New York service to nonstop next year when it takes delivery of its new A350-900, while it is also considering the launch of new destinations in the U.S. using the new aircraft.